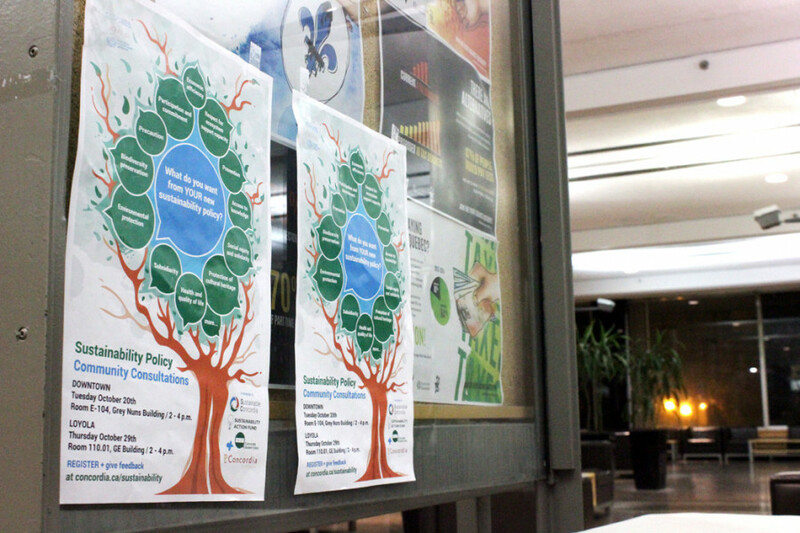 Public consultations began this week on a drafted sustainability policy at Concordia, which campus groups hope will institutionalize the university’s commitment to sustainable practices. The first consultation took place Monday on Concordia’s downtown campus and a second one will be held at Loyola on Oct. 29 from 2 to 4 p.m. Students must RSVP to attend. Student groups are also holding information sessions ahead of the next consultation. The first session took place on Thursday evening, and the next will happen at Loyola’s Hive Cafe at 5 p.m. on Oct. 28 . The policy will act as a framework for informal work students have been doing for a while, says Michael Finck, external coordinator at the student-run Sustainable Concordia. “For an institution this size, it’s high time to have a policy,” he said. The policy has been a work in progress for several years. Defining sustainability took a long time, because of the amount of input coming from various departments, Finck said. As for the consultation, Finck says Sustainable Concordia pushed to have public discussions. “Sustainable Concordia believes we were instrumental in this process,” he said. About 30 people, including Concordia administrators attended the first consultation, according to Finck, although he was not there himself. McGill created a similar policy in 2010 and the University of British Columbia’s policy dates back to 1997. Concordia’s is modelled off of these, as well as Quebec’s policy for sustainable development. “We need a sustainability policy because we need to have it part of our DNA, to support ongoing initiatives,” said Forgues. The policy isn’t an action plan, and doesn’t announce straightforward targets or actions to improve green practices on campus. However, Sustainable Concordia expects a plan to come out of it that will legitimize other sustainability initiatives, and anticipates that departments will be required to apply environmentally-friendly practices. Students can also give feedback for the policy online. The policy draft is already available on the Environmental Health and Safety section of Concordia’s website. Sustainable Concordia called the public consultation process “absolutely crucial.” The student-run group was created in 2002 to push for sustainability assessments at the university, and ranks Concordia’s efforts to be environmentally-friendly. The next assessment should happen after the official sustainability policy is released, which is expected by January. The student group oversees several sustainability projects on campus and eventually led to the creation of a sustainability coordinator role within Concordia administration. “Students played a really large role setting up sustainability, it couldn’t be done without the students,” Forgues said. So What Exactly Is Sustainability?